The Man of Bronze Phones and Clay Feet: Graeme on Doc Savage - Wait, What? Before diving into Chris Roberson and Bilquis Evely’s Doc Savage, I’d had almost no experience with the character. I knew who he was, of course—he’s one of those characters who’s ubiquitous enough that you know that, even if you’ve never read any stories featuring the character—but beyond an issue of Marvel Team-Up from the 1970s, I’m unsure whether I’d ever actually read anything that he’d appeared in. I signed up for two reasons: Roberson’s enthusiasm about the series in interviews and a curiosity about Evely’s art, which looked both attractive and oddly off in some way I couldn’t define from the previews I’d seen. By the end of the eight-issue series (the final issue comes out this week), I feel as if I can call myself a Savage fan—or, at least, a fan of the character as Roberson writes him. There’s a certain amount of… perhaps not revisionism, but certainly re-examination and restructuring of the character and his mythos in this eight issue series as Roberson takes the Doc that was and plays with him, bringing him through the years from his 1930s origins to the present day and using the opportunity to tell a story that’s as much about the failures of the character-as-was as the triumphs. Doc doesn’t change, you see. 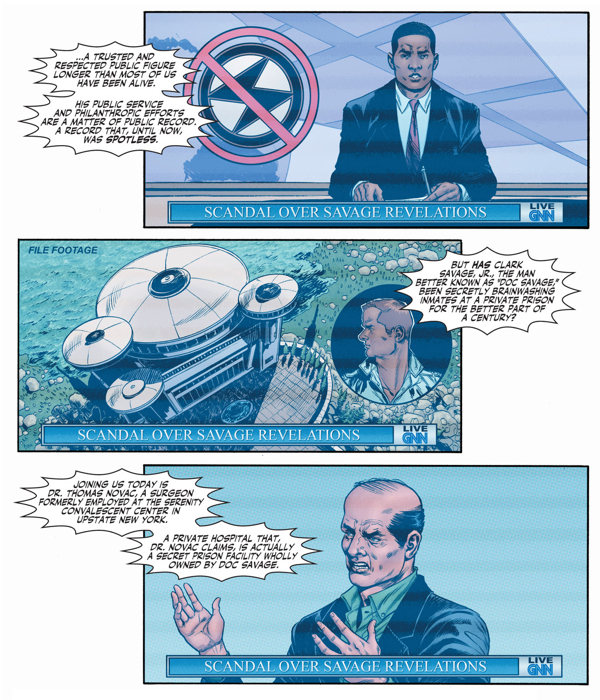 He adapts, to an extent, and takes advantage of new technology (“The Bronze,” a smartphone that sets up the final two issues of the series is something that at once feels entirely in keeping with Doc’s manner of co-opting the willing in his crusade and something that could only happen now, in these post-Global Frequency times), but he stays the same man throughout the series all the way to almost the end, and it’s that final transformation—the humiliation, in a sense, when it’s very clear that his methods have been very flawed all along, no matter how well-meaning they were—that both gives the series its final (and, perhaps, necessary) kick, but also makes the conclusion as frustrating as it is. To be fair, what’s frustrating isn’t the story being told—a story that’s fun, quick-paced pulp that slowly builds to something with more structure without the reader necessarily realizing—but the fact that, by the time it’s done, you want to read more. The humility that’s forced onto Doc in the final act when faced with the impact of his single-mindedness is dramatically fulfilling on one level, but it left me wanting to see what happened next. Did he change, or did he go back to being the Doc everyone expects, and if so, how did his support team feel about it? Why can’t there be more issues? Another reason to want more was to see more of Bilquis Evely’s work, which straddled the line between solidly mainstream, clean and attractive and charmingly idiosyncratic—there’s something about the way she does faces, and especially noses—throughout the entire run. You can draw lines connecting her work to other artists (A little bit of Joe Bennett here, some surprising elements of Kyle Baker there, and so on), but her work remained her own throughout the entire thing. She’s someone Vertigo should be snapping up as soon as possible and let her stretch her wings and play around with her look. She’s really good now, but you can tell there’s the potential for something really good in the near future. Overall, Doc Savage might be something that fits into that category: good as is, but on the cusp of being something genuinely great. 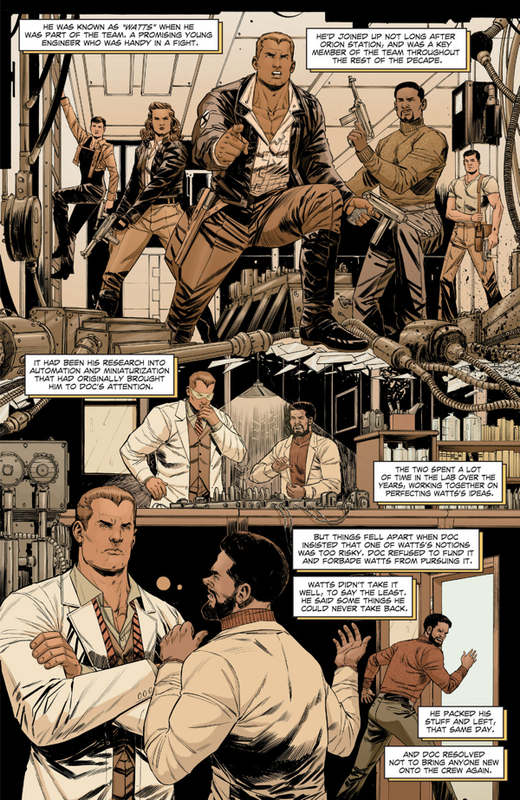 It was enough to get me on board the Doc Savage train—I’ve since gone back to explore the 1970s Marvel series which featured some unsurprisingly enjoyable work from Steve Englehart and then some less fun work by Roy Thomas—but nonetheless feels like the start of something, rather than something complete in and of itself. I can but hope that a sequel gets announced sooner rather than later, and it fulfills the promises made by this first run. 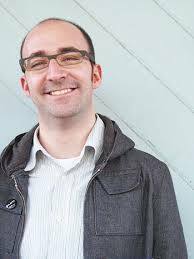 ← Stuff and Stuff: Jeff on Stuff and….stuff. Completely unrelated to Doc Savage, but wanted to post a hearty thank you regarding Zero. Normally, when you two begin to wax poetic about a less than mainstream comic, my eyes begin to glaze over. But, after hearing you talk about Zero week after week, I grabbed the first issue and was absolutely hooked. Issue 9 (which you recently raved about) was so good that it made me audibly gasp at the end. Can’t wait to re-read!